For many of us, texting is our biggest drain of minutes on our Tracfone smartphone. And up until now, the only way to add more texts was by getting a card for more calling and data as well. With Tracfone, you buy phones and prepaid minutes to allow you to make calls, send texts and surf the web on data. 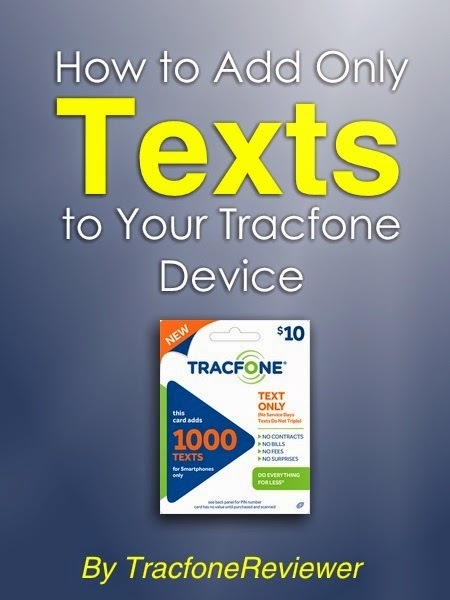 Tracfone sells a variety of prepaid cards, and each card adds more texts, data and calling minutes at the same time. However, with Android powered devices, your texts, data and calling minutes are split up, so you can run out of data or texts and have to buy more calling minutes to refill your data and texts, even if you don't want any more calling minutes. Now you can buy extra cards for data, or texts without spending more on calling minutes. This is great news, especially as Tracfone offers more and more smartphones, including through their 4G LTE BYOP program. And remember that these data and text specific cards only work with smartphones. Let's explain how each of these cards work, and how much it costs. Update: We've just created a Full Comparison of Tracfone Airtime Cards which looks at which airtime card is the best deal, and includes information on text and data only cards. Airtime cards provide you with a certain number of minutes, as well as service days. Here is the list of card amounts and service days. Remember, all smartphones also receive Triple Minutes, which triples each of these cards when you add them to your phone. There are also Smartphone Only airtime cards that offer various amounts of Talk, Text and Data. Data Cards will give you additional data, but nothing else, no additional service days are added. We would recommend trying to use your home or work WiFi that is free, rather than using data unless you need it. Here are the data cards available. And finally, Text Cards can be added to give additional text messages to your smartphone. Again, no additional service days are added. There is currently only one option for adding more texts to your phone. 1000 texts - $10 Now $5! At first glance, 1000 texts for $5 looks like a good deal, but is it? Let's break it down. Is it cheaper to buy an Airtime card or a Text card to refill your Texts? If you buy the 60 Minute Airtime card, you will get 60 texts, which is automatically tripled to 180 on all smartphones (you also get 180 calling minutes, and 180 mb of data, plus 90 days of service) for $20. This works out to just over 11 cents per text - not great. But if you got the 450 Minute Airtime card you will get 450 texts, tripled to 1350 for $80. This comes to about 6 cents per text, which is better, but not great. What if you went for the 1500 Minute Airtime card which gives 1500 texts, tripled to 4500 for $200. You would be paying 4.4 cents per text. As you can clearly see, if you only need text messages for your phone, the special text card is the best deal. But if you need additional calling, data or service days, the 1500 Minute Card is the next best deal. Join the Tracfone Family Value Plan which is $10 for the first user, and $6 for each user after that. You get 50 minutes, plus 30 service days each month, and additional users get 40 minutes. So you would have 150 Calling minutes, 150 mb of data, and 150 texts for $10 per month. 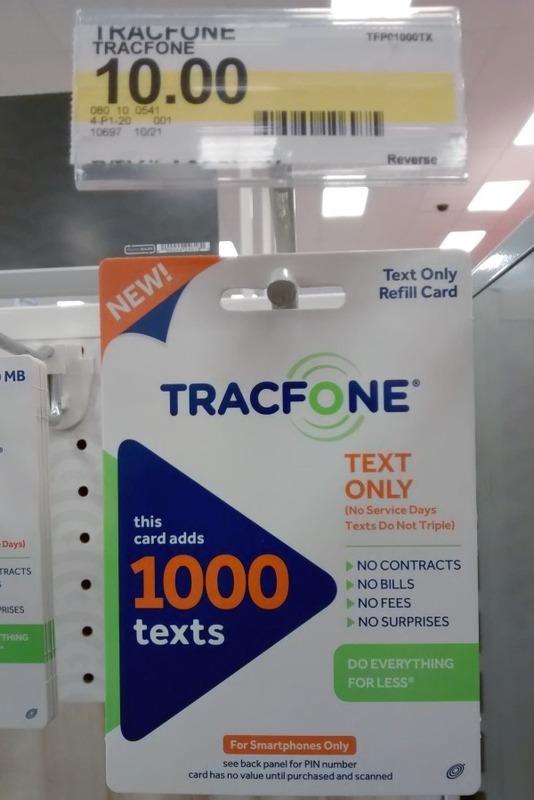 Then you can buy the text refill card, which would give you 1000 texts for just $10. You would have a total of 1150 texts per month, for just $20. And other users could do the same. This is a great option for families with teenagers who will mostly use text messages. We hope this analysis is help for you if you're comparing airtime cards. Drop us a comment below if you have questions, or additional insight to share. Be sure to take a look at our Tracfone BYOP page, which now includes 4G LTE devices like the iPhone 6, that you can use with Tracfone. You may also be interested in our Android Tracfone List which shares a summary of each of the smartphones available from Tracfone. And don't forget about our Tracfone Promo Code page, even though you can't use them with Android phones, you can still use them for all the other devices. This post details the latest on Tracfone BYOP and 4G LTE. We will continue to update it, as well as our main Tracfone BYOP page which also contains a list of compatible phones. We are excited to share the news that Tracfone has now opened their BYOP program to 4G Smartphones! Previously, only Verizon compatible 3G phones were capable of being used with Tracfone BYOP (Bring Your Own Phone). This meant the best phones you could get were the iPhone 4s, Moto G, and other similar types. While these smartphones are great, they are not top of the line. With 4G LTE now available with Tracfone, you can use the iPhone 6, or a Samsung Galaxy S6, or many other high-end devices and get the fastest data speeds. The only requirement is that it must be able to connect with Verizon 4G service to activate. We will dive into more details on activating your phone and what kind of requirements there are after we cover the basics of how the Tracfone BYOP program works. 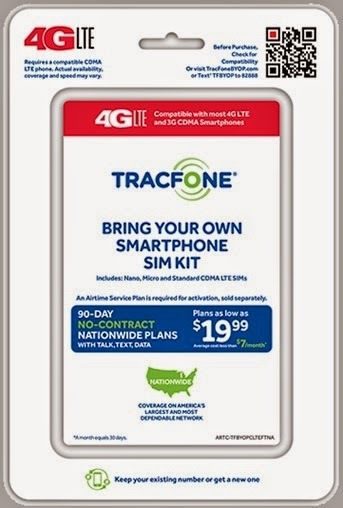 UPDATE: Tracfone is now offering Activation Kits for both CDMA and GSM devices. It appears that you can bring GSM devices compatible with AT&T to use with Tracfone BYOP. We will be sharing more details about this in a new post very soon. Using a 4G LTE device with Tracfone BYOP works similarly to bringing a 3G device to Tracfone. You will need to have your own smartphone, and it needs to be compatible with Verizon service. Tracfone contracts with Verizon to use their cell towers for service, but everything goes through Tracfone. If you go outside the coverage of Verizon, you may lose service, or run on lower speeds. To get started with Tracfone BYOP, you will visit this Tracfone page and check that your phone is compatible by entering your ZIP code and MEID/ESN. Following the steps, you will be prompted to buy an activation kit, which will give you a SIM card and Network Access Code. Additionally, you can go over to SaveonTracfone.com and buy the Activation kit there. You can choose between the 4G LTE and 3G kits, and it might be a few dollars cheaper. Most users are reporting a quick and painless process, but you should be prepared if something doesn't work right, and you need to make a phone call to customer service. The requirements for what kind of phone can be activated with 4G service on Tracfone seems a little more straightforward than before. You need a device that is compatible with Verizon 4G LTE, which includes a wide variety of top of the line devices. It also needs a clean ESN, which means it can't be in contract, or stolen. A 4G LTE device will need a SIM card to connect with Tracfone, and this will come with your activation kit. On a side note, once you have activated a Verizon compatible 4G LTE device, you can take the SIM and move it to many other devices that would not be able to activate on their own. Not all the details are clear on this, but many users are confirming switching between devices. This could be very convenient for those who want to have a backup device, since you could just buy another phone, and then switch the SIM card to it if you ever needed to. To activate your phone, make sure you have the 4G LTE activation kit (or start by getting it, which will be mailed to you in about a day) and then proceed through the steps on the Tracfone website or by calling Tracfone. 1. Get a 4G LTE compatible smartphone that runs on Verizon and has a clean ESN (is not on contract or stolen) and test it on the Tracfone BYOP website. 2. Follow the steps on Tracfone and purchase your Activation kit (SIM card) and Network Access Code. The SIM card will be mailed to you. You can Also purchase this through SaveOnTracfone.com. 3. Activate your 4G device only at Tracfone.com or over the phone. If you have thoughts or questions on this process, check out the comments below. You need a 4G LTE capable device that is for Verizon service (CDMA) to use it with Tracfone BYOP. Fortunately, there are many different phone options, and many different retailers to choose from. Used or new will work, as long as they are not currently under contract. One of the cheapest and easiest places to find phones is online. You can quickly browse many different options and price points, as well as used, new and refurbished. Follow the links below to get started and see some of the options. Once you have a certain phone in mind, you can search for that device. There are many more retailers to search including Newegg, BestBuy and more. To get some ideas, and for a full list of compatible phones for both 3G and 4G LTE, visit our Tracfone BYOP page. 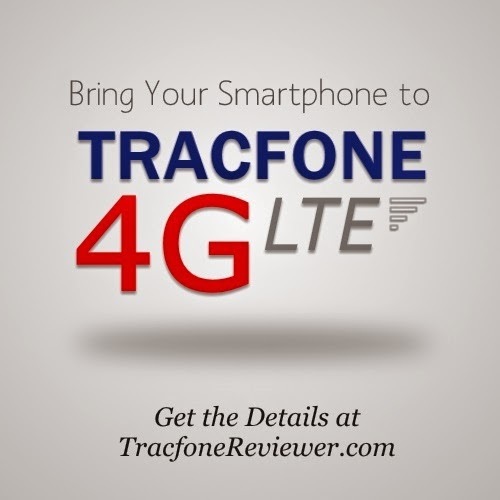 We hope this covers the exciting news about Tracfone's slow expansion into 4G LTE and hope that they will also add support for 4G on GSM networks. Please let us know if we missed anything, we strive to provide accurate and helpful information! If you're interested in other phone options, visit our Cell Phone Reviews page which includes many Android devices like the LG Ultimate 2, which was our pick for the Best Tracfone Smartphone. We have also created a list of the best Apps for Android with more than 40 great apps, almost all of which are free. I have found Clean Master App to be very handy for keeping my phone running well, and reducing wasted space. 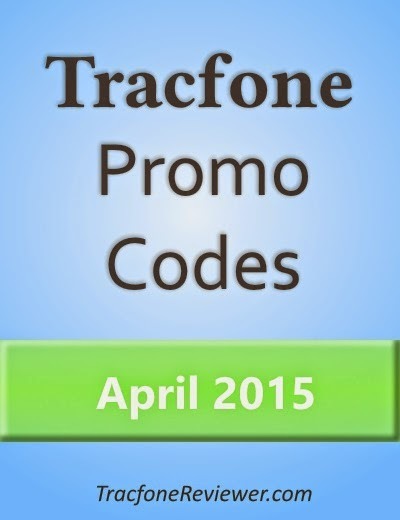 Each month TracfoneReviewer collects the latest promotional codes for Tracfone and shares only the ones valid for the current month in this list for April 2015. We hope you enjoy the free minutes! Tracfone is a prepaid cell phone and service provider throughout America. They offer service through prepaid minute cards that you can purchase in many retail stores and online. Whenever you add minutes to your Tracfone device, you can also use a promotional code for additional minutes for free! These codes are each meant for certain card amount, or any card of greater value. Also note that these codes won't work on Android smartphones. So if you are adding a 120 minute prepaid card, use the code for that amount, or you can also use the code for a 60 minute card. If you would like to see a complete list of codes, including many older codes, visit our main, Tracfone Promo Codes page! Tracfone recently released another smartphone, the Samsung Galaxy Stardust. You might want to take a look and see how it compares to Tracfone's other smartphone devices like the LG Ultimate 2, and Alcatel Onetouch Icon Pop. Remember, these codes may only work once per phone, and they don't work on Android devices. 60 Minute Card use promo code 12745 and get 60 bonus minutes! We hope you find these promotional codes useful and please let us know in the comments how they are working. We strive to provide only the best, and latest codes for you. What is the Best Tracfone Smartphone?